Fred Luthans and his associates looked at what managers do from a somewhat different perspective. 9 They asked, “Do managers who move up the quickest in an organization do the same activities and with the same emphasis as managers who do the best job?” You might think the answer is yes, but that’s not always the case. 1. 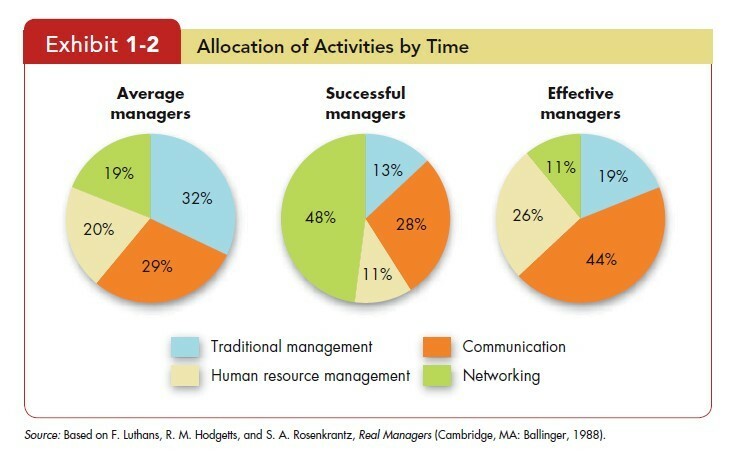 Traditional management. Decision making, planning, and controlling. 2. Communication. Exchanging routine information and processing paperwork. 3. Human resource management. Motivating, disciplining, managing conflict, staffing, and training. 4. Networking. Socializing, politicking, and interacting with outsiders. This research offers important insights. Successful managers give almost the opposite emphases to traditional management, communication, human resource management, and networking as do effective managers. This finding challenges the historical assumption that promotions are based on performance, and it illustrates the importance of networking and political skills in getting ahead in organizations.